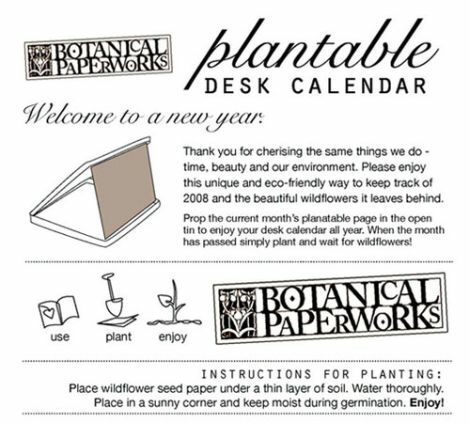 create beauty instead of trash every month with this plantable seed desk calendar. seeds are cleverly embedded into the pages of the calendar. when the month changes, simply plant the previous month’s 5″ x 5″ page in a thin layer of soil, place in a sunny spot and watch it germinate! soon you will have coreopsis, clarkia, poppies and other traditional summer wildflowers. the handmade paper is made from recycled bond, renewable abaca and cotton remnants and is acid-free. it comes in a reuseable tin and is whimsically illustrated by canadian artist kal barteski. this is a great way to do a good deed for the earth, and a fun way to teach a child about plants, recycling and being eco-friendly! 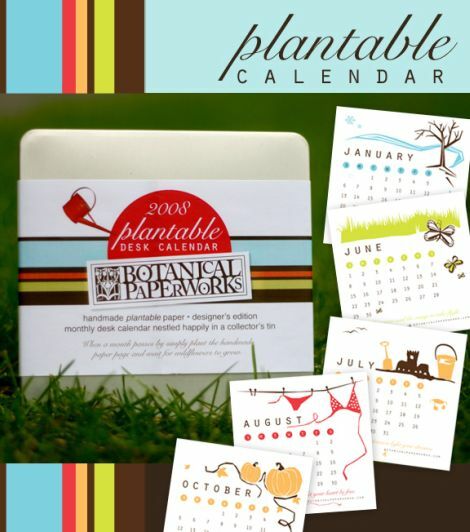 purchase the calendar and other items in the collection from botanical paperworks. it’s also available at the olive barn. How about a cell phone that turns into a sunflower? No, Gigi…read the link. It really *is* a cell phone that, when planted in the ground, biodegrades and grows into a sunflower! omg i totally did not see the link on your comment!! that is nuts, but what a cool thing if it became widely available. we might be encouraged to toss our old cell phones away on the side of the highway! i have an afinity for blackberries as well… teehee.